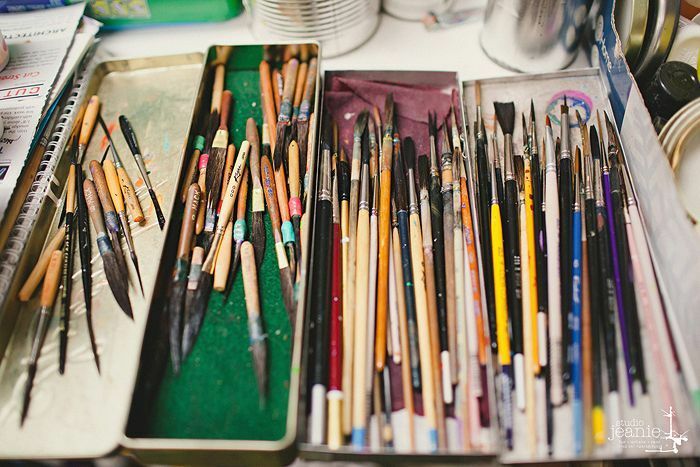 We first met sign painter John Lennig when he participated at the second Got Craft? event back in July 2007. 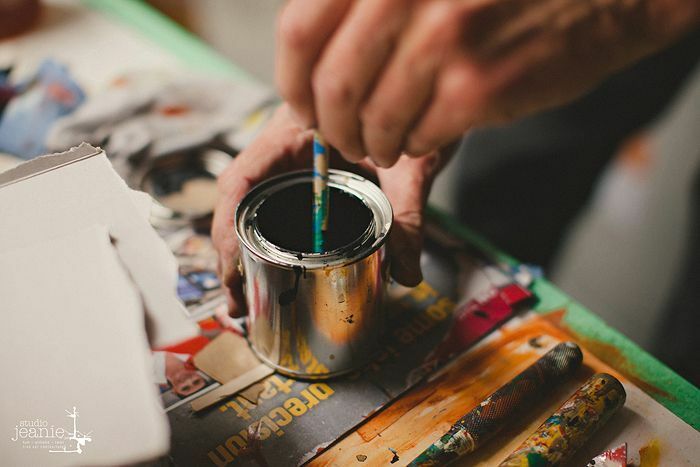 Almost six years later, we find ourselves sitting in his home eating coconut cupcakes and drinking tea while he chats about his career as a sign painter and shows us some of his past and present work. To celebrate the screening of the Sign Painter movie later this week, in which John makes an appearance, we asked him a few questions on how he started and what he loves most about the industry. 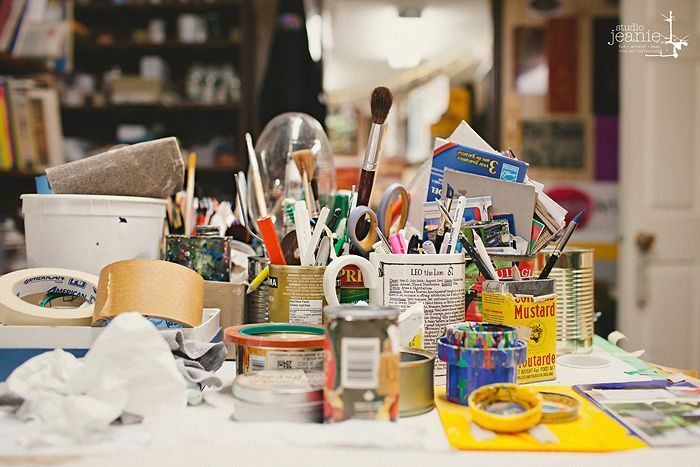 How long have you been a sign painter and how did you get into it? 50 years this September. After High School, at 18, I took a 1 year trade course for 2 years. I always took art classes in school and had planned on being a commercial artist. By fluke, I ended up in a sign painting course and after 1 week, I knew that ‘lettering’ was for me! Still is, more than ever! When I immigrated to Canada (Vancouver, BC) with my family, I worked in various sign shops until 1982, when I started my own shop, Brushworks. In 2000, I sold the shop and started BIG TOP Sign Arts specializing in ONLY hand painted lettering. Re: “disappearing” – Business didn’t disappear. It was that now customers had a much larger choice. Anybody that could type on a keyboard could create “signs”, cut vinyl lettering, and now digital prints without have the training and background in design and lettering. Prices were lowering due to “competition, while people were paying LOTS OF MONEY FOR EQUIPMENT so that they could make signs faster and charge less! Obviously, cost drives many clients, and hand lettering is not cheaper than vinyl lettering. That said, there is a place for vinyl/digital work. 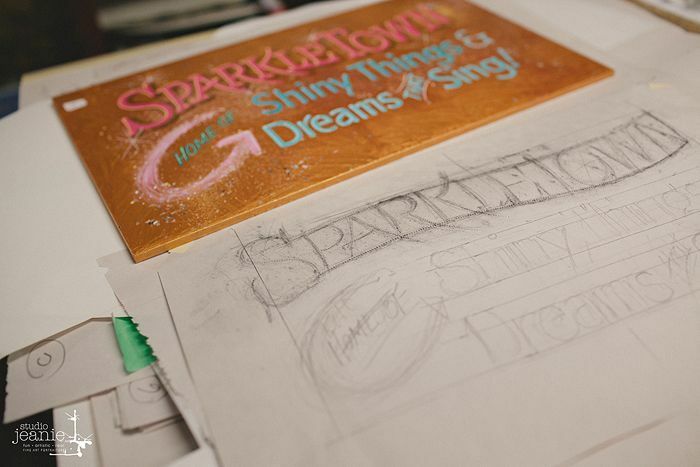 Hand lettering has been having a real comeback in recent years, which pleases me very much! Creating/producing something that others can’t produce sets you apart from the mass produced work, but it will never go back to “how it was”. 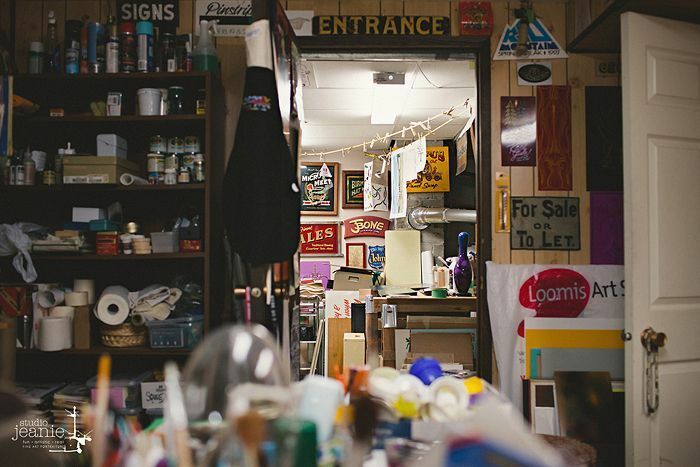 Are there any resources that you can recommend for somebody that wanted to learn the technical details of sign painting?Resources are hard to find. YouTube… various DVD’s on hand lettering… Pierre Tardiff in Quebec teaches hand lettering classes… Los Angeles Trade Technical in LA, taught by “Doc” Guthrie is a fantastic two year course that has been operating since 1926. I visited them last February and this is an awesome course / facilities – the REAL DEAL! For those unfamiliar with sign painting, what kind of tools do you use? YOU DON’T NEED A COMPUTER TO MAKE SIGNS OR DESIGN THEM, but you do need a good understanding of design. Get Mike Stephen’s book Mastering Layout…the BEST BOOK OUT THERE…period!! 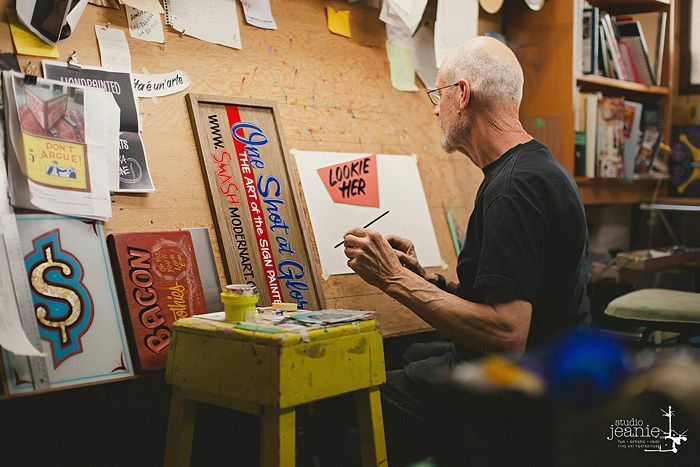 See some of John’s work at One Shot at Glory: The Art of the Sign Painter at SMASH Gallery. Exhibit runs until June 29th. For more information about the Sign Painter movie and to purchase tickets, click here. To see more of John’s work, visit BIG TOP sign arts here.